The Fibonacci sequence is defined by the recurrence relation: Fn = Fn1 + Fn2, where F1 = 1 and F2 = 1. The 12th term, F12, is the first term to contain three digits. What is the first term in the Fibonacci sequence to contain 1000 digits? This is an easy problem to solve for a small number of digits. It gets interesting once we increase the required number of digits to 1000. The R integer type can hold 10 digits at most, and the type double can hold 309 digits. There is no Big Integer class in R that can hold larger numbers, so to compute the 1000 digit Fibonacci number we will have to be creative. Here is a basic iterative Fibonacci function, that works for Fibonacci numbers with 309 or fewer digits. Integer vectors are used to store each Fibonacci number. Each element of the vector is at most nine digits long. Once all the nine digits are used, a new element is added to the vector and the Fibonacci number computation is carried over to the new element. The variable numberDigits counts the number of digits in the latest Fibonacci number. When numberDigits exceeds 999, the function exits, returning the Fibonacci number index. On my Intel Core 2 Duo 1.6Ghz laptop running Linux, this function less than 4 seconds to find the Fibonacci number with 1000 digits. We need the first Fibonacci number with 1000 digits. This number will be greater than or equal to 10^999. So we need the 4782nd Fibonacci number to get the required 1000 digits. This problem was particularly interesting to R users because it runs into an R-specific limitation. Many other languages don't have this problem and can just use a simple Fibonacci generator to get the answer. For example, in Scheme (or other Lisp variants), a naive Fibonacci implementation produces all the digits. Aside: Having started writing about R, I have found an excellent online resource, R-bloggers - an aggregator of content from various blogs about R. You can search for other R Project Euler solutions here. Be sure to check out the top articles box on R-bloggers landing page if you're looking for new and interesting applications of R.
I was just looking through the programming language statistics on Project Euler. It shows that only 7% of the problems have been solved in R, whereas 8% have been solved on any kind of spreadsheet. This is outrageous! A perfect number is a number for which the sum of its proper divisors is exactly equal to the number. For example, the sum of the proper divisors of 28 would be 1 + 2 + 4 + 7 + 14 = 28, which means that 28 is a perfect number. First we write a function to find the proper divisors (that is divisors less than the number itself) of a number n.
Next we create a simple function which checks whether a number n is abundant. With the above two functions we have the tools we need to solve the main problem: finding the sum of all positive integers which can not be written as the sum of two abundant numbers. All the numbers greater than 28,123 can be written as sum of two abundant numbers, so we only need to check numbers smaller than 28,123 for this property. The vector abunlist in the code below holds all abundant numbers starting from 12 to 28,123. With every new abundant number than we find, we create all possible two abundant number sums and store them in the vector sumno. The answer we're looking for is the sum of all numbers 1 to 28,123 except the ones in the vector sumno. This is certainly not the most efficient solution, but runs in approximately 25 seconds - well within the stated 1 minute goal. Note: The code for this post was formatted in Pretty R at inside-R.org. I was navigating through a large Java project today, and I needed some source tools to help me visualize the massive class hierarchy. Looking on Google didn't produce anything obvious: people pointed to eUML2, which was difficult to install, and some tools didn't generate UML from existing code. After a while of searching, I remembered the Doxygen utility which writes documentation from source code. It works on C,C++, and Java, among many other languages. While its diagrams might not be perfect, they were very helpful for C++ projects in the past. So I decided to give it a shot. It worked out beautifully. Here are the steps involved in generating UML diagrams. Then, run doxygen to generate a config file. Now you have a config file called Doxyfile. 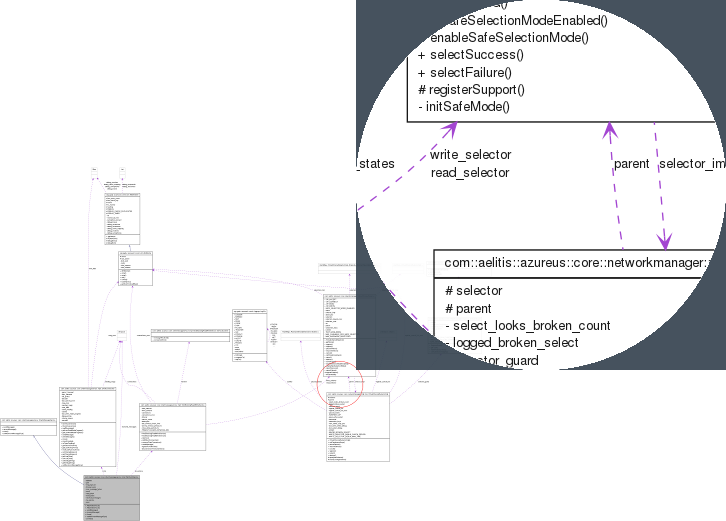 Edit this to allow recursive searching, to look for java source, to generate call graphs and to generate pictures, and to generate UML style diagrams. Here are all the changes I made to this file. To test this out for a blog post, I downloaded the source code to Azureus, a large Java-based project. Here is a graph from one of the files. The top right shows a close-up view of a tiny section of the picture. Even in this simple example, you can see how a zoomed-out view allows you to understand the complex structure. Doxygen reads code written in C, C++, Java, and many other languages. So if you are in need of UML style diagrams to better understand a class hierarchy, give it a try. It is freely available, easy to install, and easy to use. In addition to class graphs, it can also make call graphs and caller graphs. I solve Project Euler problems for recreation. I am using the Statistical Language R to solve these. R is free for use and download, so I would recommend downloading it if you are interested in Statistical computation. Using names.txt, a 46K text file containing over five-thousand first names, begin by sorting it into alphabetical order. Then working out the alphabetical value for each name, multiply this value by its alphabetical position in the list to obtain a name score. For example, when the list is sorted into alphabetical order, COLIN, which is worth 3 + 15 + 12 + 9 + 14 = 53, is the 938th name in the list. So, COLIN would obtain a score of 938 x 53 = 49714. While this is an easy problem, its solution involves some nice R concepts. Let's go through solving this in R.
The scan function reads free form text and stores each element in a vector. We specify that the input is character data separated by commas. That should do the trick, right? Unfortunately, this does not work. After many minutes of scratching your head you'll find that one of the names in the file is 'NA'. This confuses the scan function since it is interpreted as the constant NA, or "Not Available" in R. This can be fixed by setting an na.strings argument in the scan function. This should be a trivial method to write in a C-style language where you can turn a character into an integer. R, however, has no internal ASCII table that I could find. If there is a simpler solution, please let me know. The scoring function gets the name as an input, pulls the score for each letter in the name and then adds up the letter scores. The vector of name scores is obtained by applying the score function defined above to each name in nlist. We use the sapply function, which gives a simplified vector output by default. The vector of weights is a sequence of numbers from 1 to the length of nlist. Multiply the two vectors to get the vector of weighted scores. This was an interesting problem to solve in R. It demonstrates the flexibility of R in reading and processing free form text. Trying to do a similar task in SAS would be hard. Want to read good fiction? Read "Binary", by Michael Crichton, one of his best works that you've never heard of. Yes, that Michael Crichton. 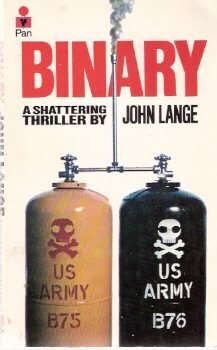 The first book I read by Michael Crichton was an unknown book called "Binary" that none of my friends had heard about. I was in high school, and my father's friend had dropped this short book at our place. The author was John Lange, whom nobody had heard of. Inside, the book mentioned that the author was now revealed to be the great Michael Crichton, but I hadn't heard of Crichton either, so I wasn't expecting much. The book starts with a gripping description of a heist. It grabs you, and pulls you in. The book is a thriller, of a plot involving dangerous weapons, and one man's race to stop it all. It is a short book, written very well. I had harbored fond memories of this book. I had recommended it to many friends, knowing full well how difficult it was to obtain a copy. Recently, I received a copy of this book, and I sat down to read it. A short evening passed, and I was done. Despite having read it over a decade ago, I remembered most of the plot and many of the scenes. It was a thrilling book made punchier by the fact that I knew the story. I marveled at the plot and the excellent writing. A fantastic novel, a thrilling plot. The ending isn't blockbuster by today's standards, and that is part of the lure. No superfluous nonsense, and no extra pages. A snappy story beautifully told.